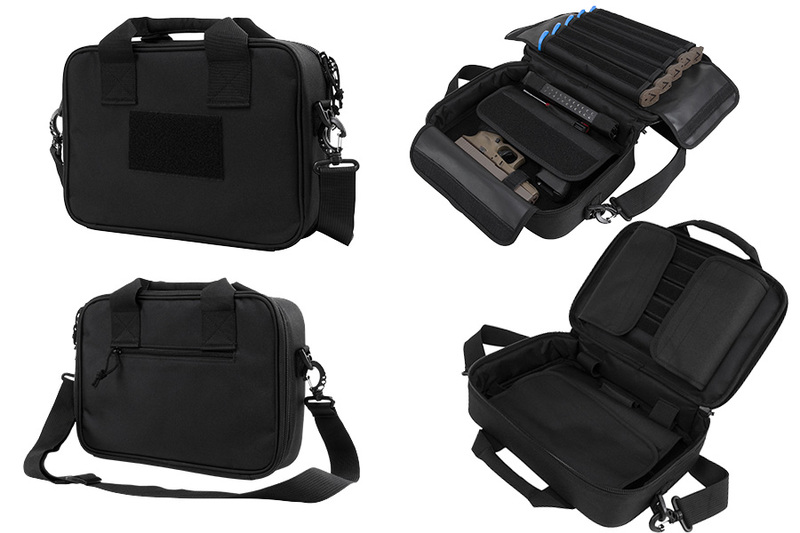 VISM Double Pistol Case Rangebag, Black Nylon, Padded With Mag Pouches. VISM double pistol rangebag case in black. Features room for two full size pistols in main compartment secured by velcro straps, with two flaps to keep pistol finish protected. Also has five 9" mag pouches, with velcro at both ends to accommodate 10 standard double stack mags, or 5 long 30rd type mags. Also has a zippered pocket for extra accessories. Zipper pulls are lockable with a padlock. Easliy carried with handle or shoulder strap. Approx. 13"x10". Mfg # CPDX2971B. Very good Case - I ordered 3 more. Great gun case. Well built, sturdy and at a great price. I have recommended these cases to my Arizona West Valley Gun Club membership. Great product, good price. Sturdy, well made.